Some dingbats tried to blow open a cash machine/automatic teller machine at the local shopping centre on the weekend. Despite blowing the machine out of the wall and causing damage to the adjoining shops, the money wasn’t forthcoming and the would-be robbers fled empty handed. 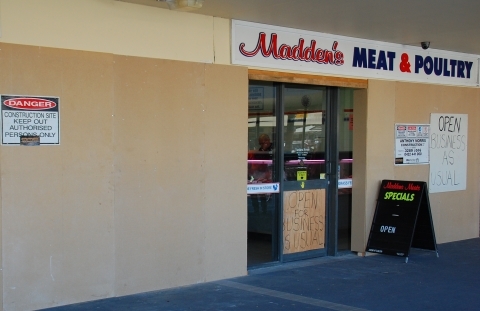 The damage to the adjoining shop, a butcher, was so bad that his store has been boarded up all week. A terrible inconvenience for his customers and potentially devastating for the butcher’s livelihood. The butcher finally managed to get his store reopened today. Sure, most of the shop is still boarded up, but at least he’ll get a few bucks in to keep things turning over. But the butcher is missing an opportunity. He’s missing an opportunity to engage customers and prospects. You see, my wife and her friends have been talking amongst themselves on how sad it was that the butcher had to close all week because of the people trying to blow up the cash machine. They really empathised with the butcher and how hard it would be for him to keep his business going. All the butcher has done is throw up a couple of dodgy “Open Business as usual” signs. He could do so much more to not only let people know he’s open for business, but he can use the explosion as a hook to engage potential customers. # 1: Letter hand delivered to every house in the adjoining suburbs. As you might know, one of the cash machines at the 19th Ave shops was exploded on the weekend in an attempt to get to the cash inside. Whilst the bombing was ineffective, it has caused a pretty big effect on others. My store, Madden’s Meat & Poultry (we’re the butcher shop next to the bakery) was damaged during the explosion and we’ve needed to have the shop closed since the weekend. As you can imagine, this was a pretty devastating blow to us and our team of butchers – with meat needing to be tossed out, repairs needing to be made and our employees having to take time off. As a small business, times are pretty tough and an incident like this does have a big impact on us. It’s the last thing any small business needs. We’ve been taking care of our great customers for over 10 years and have always prided ourselves on delivering great quality meats at a reasonable price and our long opening hours of 8 am – 5 pm 6 days a week. But right now, we need a little help to overcome the effects of having to shut up shop AND take care of the damage. We’d really appreciated it if you could help us out – if you could call into the shop and say hello and consider buying your meat from us this week, even if you don’t usually. I’m sure you’ll be delighted with our value and our service – we sell great quality meat at a great price. If you bring this letter in before next Friday (September 11), we’ll also give you a 5% discount on your purchase as our way of saying “Thanks”. Thanks for reading this letter. Hope to see you soon. As we always see, people are only to willing to help those need. It’s very simple marketing, but that’s usually the marketing that works.